For those wanting to learn the basics of piecing quilts, here is your chance! We've developed a new project to teach you all the basics while you make this versatile row quilt. You will learn how to rotary cut efficiently so you don’t waste fabric and you will figure out how to create that illusive scant 1/4" seam you need for accurate piecing. 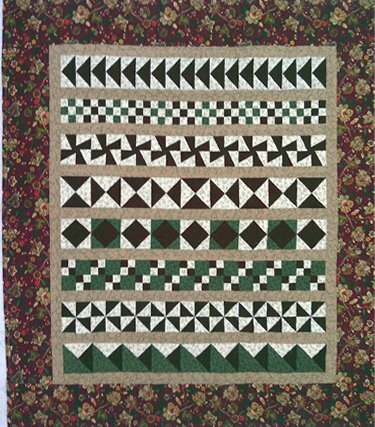 You will learn to do a little problem solving when things don’t go together as well as you would like and in the process you’ll make a very nice row quilt top that is a good lap size. We cover the quilter’s magic numbers while you make the most common components used in quiltmaking. We cover when to pin and when you don’t have to, pressing for ease of construction as well as applying sashing and borders . This class is packed with good information to get you making quilts efficiently and accurately, which makes it all the more fun. $77.50, meets for five class times.